Written by Staff on February 6, 2016 . Posted in Information. Packaging is marketing, so don’t settle for “good enough.” Get the exact size, color, and printing that you want. Since we only work with barrier packaging, we offer you a much higher level of customization and specialization with over 30 films to choose from, and custom color and printing capabilities. We also offer a stock bag program that helps us fulfill even the smallest of orders! If there is a barrier packaging solution, we have it! Being a small company, we offer more personal, responsive and detailed customer service then the 800 pound packaging gorillas or Asian-based competitors. You never get a call center; our American-based sales, converting, and printing services reduce errors that can occur with communicating complex packaging requirements. We try to personally respond to all customer inquiries within 24 hours. Unlike our foreign competitors, we have typical non-printed lead times of no more than 2 weeks. By specializing in barrier packaging (and not just importing containers from China) we can offer some of the lowest Minimum Order Quantities in the industry even on custom runs. Expediting is available that can cut these leads even more. Until the Pacific Ocean shrinks, China can’t touch our lead times! Material Sourcing: Our films are extensively tested, FDA approved, and toxin free. Our films are sourced from both U.S. and foreign producers know for quality and honesty. Some dishonest foreign producers know it takes extensive knowledge and expensive testing to verify quality and composition claims, as a specialized company we have a extensive quality control program to ensure only quality materials go into your packaging. Workmanship: The highest quality workmanship focuses on the details. The seal bars are coated in Teflon, a costly and often skipped step that makes our seals crisp and strong. Precision Totani pouch converting machines make accurate sizes, seals, and features. We even sub-pack your bags in units of 100, or you may customize. Testing and Packing: We keep multiple retains from each order. The bags are produced in an approved facility. In addition to the film testing we can also perform dunk tank testing for seal quality, and burst testing. 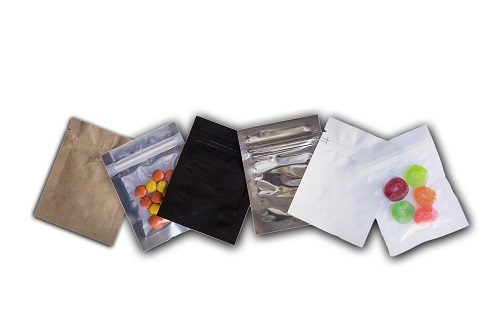 Bags are usually shipped in cases of 500 or 1,000 and for easier handling in sub-packs of 100.